LOT-EK’s industrial chic loft for a techie. Lucie Young plugs in. Call it a pod with a view. When Josh Morton wakes up in the morning, he presses a button, and up go two hydraulically lifted flaps on the sides of his bedroom. This flashy DeLorean-type-car maneuver is accompanied by a grinding noise not unlike an old freight elevator. Mr Morton’s dog, Ski, used to wake him with a kiss. That was before the apartment was redesigned. These days, Ski prefers to stay downstairs, gnawing a blue rubber bone, on the green Astroturf rug. Some of the visitors to Morton’s West Village apartment share Ski’s queasiness, while others want to stay forever. ‘The guys are like, “Wow, this is cool,”‘ he says. Women tend to ask about claustrophobia and the safety factor. ‘You get all these questions like, “Is it easy to clean?”‘ And there is some concern that the master bedroom is basically the male equivalent of a giant electronic Venus’s flytrap. Morton, who is single, isn’t overly concerned. ‘It is like a litmus test,’ he said. ‘There are a lot of people who are like “I want to sleep here,” and they are my people. The one’s who don’t like it, I don’t need to know’. Turbulent sleepers and sleepwalkers – there is also a guest pod – need not apply. At parties, Morton says, most of the guests gravitate upstairs, ‘There are usually eight people in each pod hanging out, chatting. You get a good view of the action below.’ The feeling inside the pods is not unlike the colorful padded ‘womb’ rooms in hip New York clubs. The downside? ‘Invariably someone spills a drinks up there,’ Morton says with a sigh. At 30, Morton has made enough money from his job as a Mac computer consultant to realize his design fantasy. He wasn’t sure what he wanted at first. ‘ I spent a year digging holes in the walls,’ he recalls. Then he came across an article featuring a loft in which a bedroom had been placed inside a shipping container. Impressed, Morton went to the source: he called the hip New York firm LOT-EK architecture and asked it to concoct a new interior. The founders of LOT-EK (pronounced LO-tek), Ada Tolla, 36, and Giuseppe Lignano, 37, are notable for their love of heavy-duty salvage. Their motivation, they say, is not simply a commitment to recycling, ‘It is about ideas of containment,’ Tolla explains. It’s also about the about the iconic status of industrial containers. Logos are left intact, and visible signs of wear and tear are cherished for their authenticity and street cred. 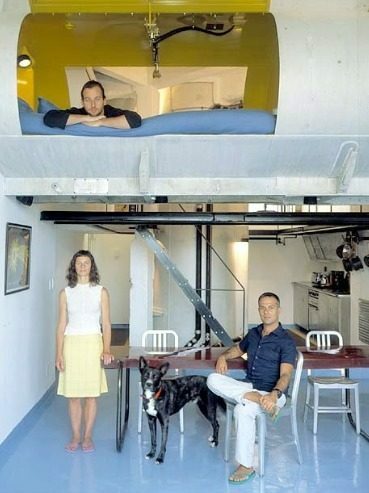 For Morton’s 1,000-square-foot apartment, the main container is the tank of an oil truck, which has been sliced in half. 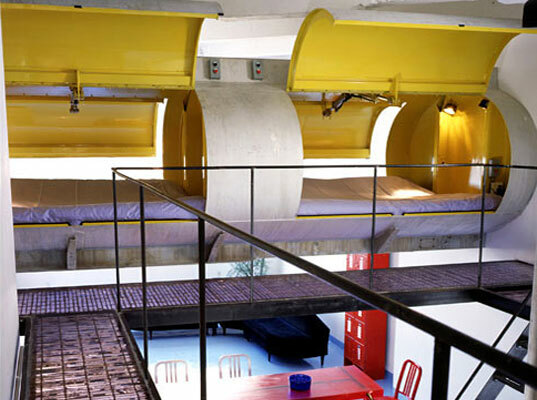 One part is suspended horizontally across the apartment to form the bed pods, and the other stands on end to form two bathrooms stacked one on top of the other. Morton couldn’t be happier with this spaceship-style configuration, even though the ‘rooms’ are a tad confining. He can’t strand up straight in one part of the upstairs bathroom without hitting his head on a concrete beam which hangs lower than his six feet. This, he says, is a minor inconvenience offset by amusing features, like as a peephole concealed inside a medicine cabinet, which allows him to see what’s going on in the kitchen. In the course of remodeling, the architects exposed a nine-foot concrete beam containing a waste pipe that lay like a felled tree between the kitchen and the living area. When permission was refused to sink it under the flooring, they turned it into a feature by adding two stainless-steel bowls, making it New York’s most outlandishly large dog dish. And Morton doesn’t seem to mind hopping over it on his way to the refrigerator. ‘The apartment is an art installation,’ Morton says. The architects had the final say on almost every detail, including the paint colors, which they refer to as ‘safety yellow’ for the inside of the bedrooms and ‘fake water blue’ for the floor. Will Morton tire of his new fun house? ‘Maybe in 10 years,’ he says. For the moment, he loves the eye-popping colors, ‘Blade-Runner’ catwalks and ‘Jetsons’ -style bed pods, which LOT-EK fashioned with him in mind. ‘We pay a lot of attention to the client’s personality,’ Tolla says with characteristic simplicity. Individual quirks aside, LOT-EK’s work seems to tap into something primal – in this case, a certain male fantasy. Morton’s greatest pleasure, he says, is that while working at his red resin dining table he can look up at the hull of the oil tank above, see all the dings and dents from when it was on the road and read its original plate. ‘It carried 7,200 gallons of gasoline and weighs about 100 pounds per linear foot,’ he boasts. Whereas once he used to enjoy playing with trucks, now he gets to live in one. The interior functions not in an old-fashioned practical sense, but as a container of dreams.